Congratulations to the founding editors of Phoenix Rising — Lori Lai, May Lee, Susan Lee, Pam Nishikawa, Gisele Pohan, Marie Shim, Doreena Wong, and Zee Wong — our 2017 Phoenix Award Honorees! 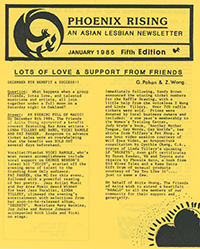 In early 1984, a handful of women gathered to establish a newsletter to claim a flourishing space for Asian/Pacific lesbian community. 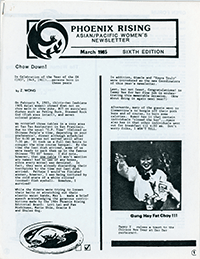 A number of them had met each other through the Asian Women Feminist Group and would seed the formation of Asian/Pacific Sisters, one of the earliest and largest grassroots organizations at the time at the intersection of lesbian and Asian. 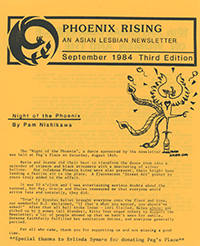 The newsletter titled Phoenix Rising aimed to connect, support, and build the Asian/Pacific queer women’s community in the San Francisco Bay Area, long before the advent of social media. In its early years, the publication served as a significant platform for queer A/PI voices. In articles that shared both personal experiences and political philosophies, dykes, lesbians, and queers forged identities, developed livelihoods, and sought out partners. Phoenix Rising defied stereotypes of quiet Asian women bound by strict families, immigrant values, and submissiveness. Instead, contributors affirmed each other’s existence and built community to boldly assert that A/PI queer women could not be ignored. Many proudly posted their real names, declared themselves as lesbians, and supported Asian Women’s Study/Support groups during an age when homophobia, anti-Asian animosity, and misogyny existed acceptably in media, government, and policy. More than 44 issues that ran across a decade gave voice to queer Asian women and broke down barriers in both ordinary and extraordinary ways. The 2017 Phoenix Award honors the founding editors of Phoenix Rising – Lori Lai, May Lee, Susan Lee, Pam Nishikawa, Gisele Pohan, Marie Shim, Doreena Wong, and Zee Wong.